In June of 1934, members of the Hahn family discovered a chunk of limestone rock with wood protruding from it. They chiseled it open, exposing a fascinating hammer head. A small portion of the hammer was filed down to confirm that it was in fact metal. Over the decades this cut has remained shiny and has not rusted. 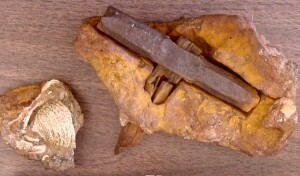 The artifact was found near London, Texas by a waterfall on Red Creek. This site is part of a large geographical zone called the Edwards Plateau and it primarily consists of Cretaceous rock. Several miles upstream, masses of shell fossils are found that match the fossils in this concretion. What is this odd little hammer? Its unique construction make it doubtful that this was a miner’s tool from recent times. The hammer, which has became known as the London Artifact, is now part of the collection at Creation Evidences Museum where it has been extensively analyzed. The handle is permineralized and has a blackened coalified tip. 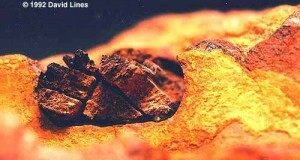 The head is made out of a rare iron mixture with chlorine. Could this be a pre-Flood tool? Many scientists have expressed skepticism since the artifact was not found in situ by a professional. But the composition (chlorine fabricated with metallic iron) remains a puzzling enigma. We know that iron was a metal that was in production in the pre-Flood economy (Genesis 4:22). The extraordinary resistance to corrosion, even in the Texas humidity, points towards specialized metallurgy. Could the rock concretion itself have been recently produced in the river? It does not seem that the rock matrix surrounding the hammer is of modern origin. There are none of the riverbed gravels embedded in the concretion. Instead the sandy composition matches the Cretaceous source rock upstream. A careful search of the river itself reveals that there are no unabraded shells available in the riverbed (and indeed very few shells at all). Moreover, the approximately ten shells in the rock matrix show no signs of having been reworked, which would indicate a more recent concretion.